Oxide charge referenced to adventitious C1s peak at 284.8eV. 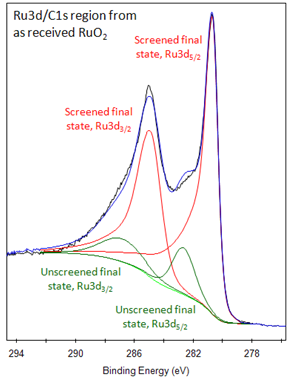 Ru metal and RuO2 both give asymmetric Ru3d peaks shapes. For ruthenium metal and RuO2, the Ru3d3/2 component is shorter than expected (for a d5/2, d3/2 doublet) and is much broader than the Ru3d5/2 component. There is a very strong overlap between the Ru3d and C1s regions. 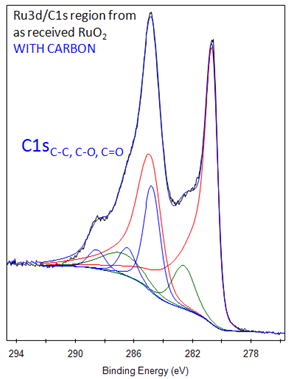 If possible, peak fit a clean standard ruthenium material to develop the fitting methodology and then add C1s peaks as required (see below). Ruthenium is a member of the platinum group, which also includes rhodium, palladium, osmium, iridium, and (of course) platinum. Ruthenium rapidly oxidizes, but does not tarnish in normal temperatures. 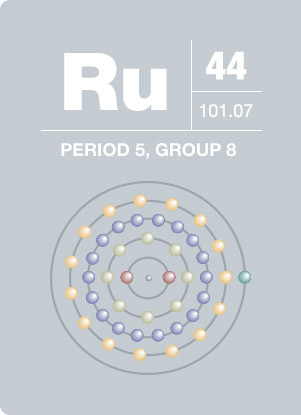 Small amounts of ruthenium can enhance the properties of other elements. Platinum and palladium become harder, while titanium is more resistant to corrosion after the addition of ruthenium. Ruthenium also catalyzes the splitting of hydrogen sulfide and other chemical processes. Ruthenium may have anti-cancer medication applications as well. This element is primarily found in the Ural Mountains and North and South America.